Does History Have a Role in Society? Sarah Dunant’s opinion piece, “What is history’s role in society” makes some good points. These and many works like them have helped to revolutionise our view of the past, incorporating the richness of the ordinary and the iconoclastic. Like a huge pointillist painting, the background to all those well-known central figures is slowly but surely filling up with depth and colour from thousands of dots of new historical knowledge. This seems in line with recent concerns about hero-worship in the history of science, a concern that certainly applies equally to history in general. She attributes this shift to the influence of Marxism in historical practice. All this exposes the current assault on the humanities within higher education as even more philistine. As far as one can tell the thinking goes like this: the study of history, english, philosophy or art doesn’t really help anyone get a job and does not contribute to the economy to the same degree that science or engineering or business studies obviously do. Her comments here reflect common sentiments. The humanities make nice hobbies but really don’t warrant spending any real time or energy. Even at a place like Haverford faculty in the natural sciences have been overheard suggesting that we abolish non-science general education/distribution requirements. After all, the thinking goes, the sciences made and continue to make the modern world. Why would we expect students to study anything else? … The humanities, alongside filling one in on human history, teach people how to think analytically while at the same time noting and appreciating innovation and creativity. Not a bad set of skills for most jobs wouldn’t you say? As for the economy – what about the billion pound industries of publishing, art, television, theatre, film – all of which draw on our love of as well as our apparently insatiable appetite for stories, be they history or fiction? Lots of teaching in the humanities does not, sadly, teach people how to think analytically or teach them to appreciate innovation and creativity. The humanities can be a mechanism for helping students develop analytical thinking skills and learn to appreciate innovation and creativity, but the humanities can also be a dull recitation of names, titles, places, dates, and facts. Moreover, the humanities don’t have a monopoly on teaching students how to think analytically or to appreciate innovation and creativity. Any discipline properly taught can accomplish those goals. M.C. 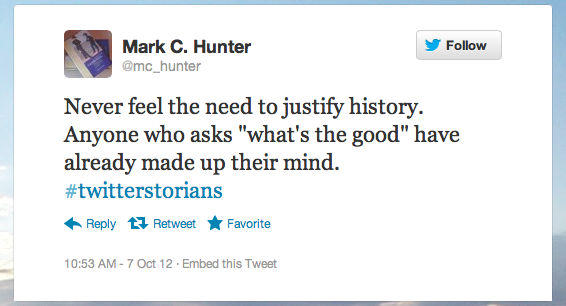 Hunter thinks we should never justify the study of history. The ostrich approach will further marginalize history and ensure its colonization by non-historians. Perhaps in some distant past and foreign country historians commanded the respect and awe of scientists as well as the general public—when professional history wasn’t boring—historians no longer commanded that respect. We have to be able and willing to convince skeptical or ill-disposed colleagues that we have a unique and valuable expertise, that we help make the world a better place.